My Starz LG 2008 finally get my attention because 'org kampung' is among the Top 12. There are two of them; that is Fiona John Nolly and Cassandra Daniel Manja. Both of them are singers with albums in Sarawak. I definitely know Fiona or Nana (as we use to call her) more than Cassie as we are both from the same village, Kampung Pisa Krokong (kasi promote sikit kampung). I didnt know about this until my colleague, Erince told me about it during lunch. So as a busy body, I search for this My Starz LG and show both of them as the contestants for My Starz LG 2008. Now, at least I have the reason to watch this program until the final. Hopefully Fiona @ Nana can make it to final as she has the talent and she did work really hard as I noticed that her voice become more matured than before. 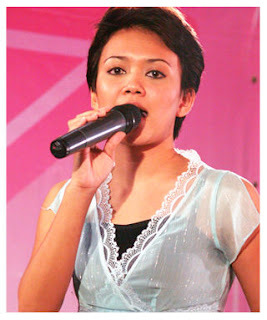 She started to sing since small and actively join her father and uncles's music band performing in any wedding reception until somebody did help her to produce an album of her own for the music industry in Sarawak. I think she has more that one album if I am not mistaken. Back in 2005, she won the Miss Fair & Lovely Beauty Pagent together with Miss Anggun Talent Night during the World Harvest Festival (WHF) in Sarawak. As for Cassie, she also joined and won herself the 1st runner up for the Miss Fair & Lovely Beauty Pagent together with Miss Anggun Talent Night 2008 for the same festival (in which my best buddy, Pearl secured the Miss Fair & Lovely's crown).